Th-INK-ing of You: SSIC Two of Everything! Hello friends! 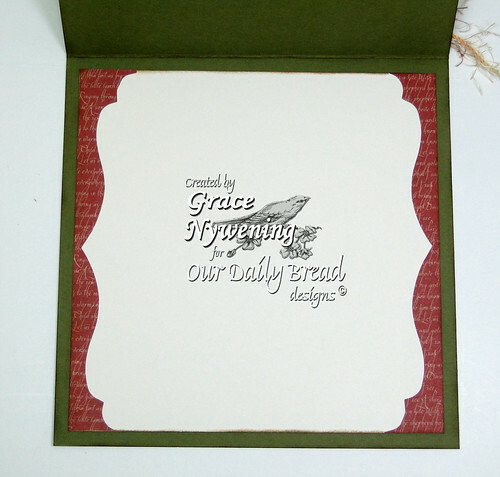 It's Sunday and time for another Stampin Sisters in Christ challenge! Today our hostess is the sweet and talented Miesje. Miesje has chosen Matt. 11:28-30 for this week's Scripture. "Come to me, all you who labor and are burdened, and I will give you rest. Take my yoke upon you and learn from me, for I am meek and humble of heart; and you will find rest for yourselves. For my yoke is easy and my burden is light." Miesje's challenge: Sharing: use 2 of everything you use. ie: 2 Dp - 2 flowers - 2 stamps - whatever you use two. I love this passage but I think it's often misunderstood. I don't think Jesus is saying that if we come to Him, our lives will be easy and all will go our way! Earlier this week my family and I spent 4 days at Colonial Williamsburg. One of the things we saw was an old yoke, which was used to bind two oxen together so that they could work together in doing the work of plowing, etc. The yoke is made of heavy wood and is worn around the two oxen's necks. It does not give them hardly any room to move without the other one. Imagine the struggle if one ox has a fly biting him on his back, and he wants to reach around to remove it. It would be almost impossible! That to which we are yoked can be very burdensome to us, or it can be a great blessing to not have to do the job at hand alone! Most likely Jesus is talking about the burden of sin which we all bore until we turned to Him for our salvation. He could also be talking about the burden of trying to follow a "religion" which weighs the follower down with rules and regulations that are burdensome to say the least, and are not going to do a thing to save a person's soul! Jesus, however, offers not religion, but relationship. When we become yoked to Him... He gives us rest from the burden of sin we have been bearing, and He teaches us (if we are listening) how to be His disciple. Living a life for Christ is not necessarily always easy..... we all know that we still face trials throughout our lives. However, living a life in relationship with Him is not burdensome... He fills us and empowers us to serve Him and instead of being burdened by our sin, or religious rituals, we respond to Him because of His great love for us and all that He has done for us, and the love that we in turn have for Him. Gone is the worry of where we'll spend eternity. Gone is fear of the future. Gone is the worry that our needs might not be met, because all His promises are ours if we have yoked ourselves to Him. To look at the analogy of the yoke again.... when we are yoked to the One who is all knowing, all powerful, and all loving.... we have the advantage of having all His help in doing whatever tasks He may lead us to do! He is yoked to us just as that second ox is and it is not burdensome to do anything because we are not on our own... He is right there leading, guiding, and empowering us! I have to share with you that this passage is particularly meaningful to me right now, as on Friday my husband was suddenly laid off from work. It appears that all he was working for in a retirement and having our insurance paid into retirement has been taken away. However, those were "our" plans. God sees the bigger picture and has a plan for us.... and it's a plan for our good, and we are trusting Him to meet our every need. It's so wonderful knowing that we are yoked to the ONLY ONE who can fully be trusted. He's been faithful and will always be faithful because it is one of His many attributes! We do appreciate your prayers as we seek His will for the future. 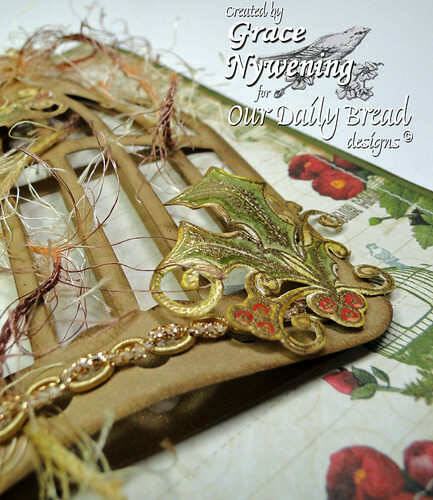 For my card today, I used one of this month's releases from Our Daily Bread designs, Holiday Ornaments, which I stamped twice and embossed in gold. I water colored the holly and then fussy cut the images out and sponged with distress inks to age. I cut two birdcages out of Recollections brushed gold with a T Holtz die. laying one flat and then popping up the second one on top to give some dimension. I used two designer papers from Websters Waiting for Santa/ Sweet Season combo pack and made two bracket cuts with the T Holtz Bracket die. For my embellishments, I used two trims: lace (Websters) and the gold trim at the bottom of the bird cage. I used two fibers, and I cut two Spellbinder's Holly Accents from brushed gold, then sponged and interwove them to make a sort of medallion effect in the center of my lace. I added two pearls. On the inside of my card I used two of the negative cuts from my bracket die to finish off a pretty edge there as well. We thank them for their continued support! Oh Grace this is way beyond gorgeous. I love everything on this!! Your holly and berries are so pretty ... love all of your x2 embellishments ... so glad you went caroling with us at jingle belles. Hi Grace.. Have a doubt regarding the challenge in SSIC. All the things used in the card should be doubled or few things doubled is enough? Can u please let me know? Oh Grace, this is beautiful! So elegant and I really love how you did the inside of the card too! I loved your devotion - your explanation is perfect and how neat that you saw a yoke! Know that you are in my prayers, always and especially now! God Bless! Thank you for sharing your wonderful message about Christ's love. I am so sorry to hear that your husband has been laid off, this is happing to so many who are near retirement and so unfair. I will keep you in my prayers that God will open a window to a brighter future. Your card is absolutely stunning, Grace! I love the papers and all the dimension and die cuts! Gorgeous! I am so sorry to hear your news. I'm sure it was a shock to you both. Keeping you and your family in my prayers. Will catch up with you very soon. Grace--this is so beautiful!!!! I love everything about it! The lace you used is gorgeous! Thanks for playing along with us this week at Speedy the Cat's Friends challenge! Thank you so much for sharing that message. It spoke a lot to me. I am so sorry that your hubby was laid off his job. What you have lost I know the Lord will restore ten fold. I don't know you personally but know that you are a special Christian woman who always blesses me and others with your wonderful encouraging messages. Sometimes our trials seem too hard to bare. We are so blessed to have Jesus to turn to and be yoked to. Thank you for reminding me of that fact. Your card is quite different to your usual ones...I think. it is just as beautiful though. I love every detail. So beautifully put together. Grace, this is beautiful and I love the theme. Your message was awesome and you truly are a messager for our Lord! Best wishes to your husband and just continue to trust Him! 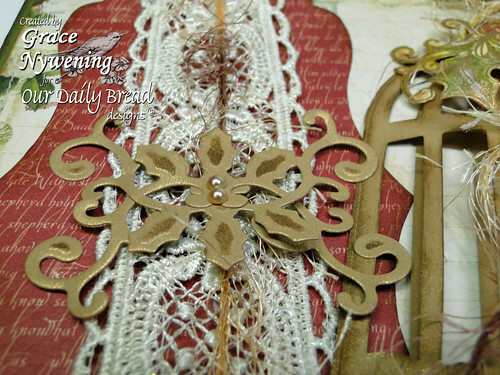 The small details are delicate and gorgeous, yet it is a 'strong' card. I'm not sure if the meaning comes across without the linguistics but I'm hoping so. Just know that I think this is fabulous!!! Keeping you and your husband in my prayers especially during this time of unexpected changes in your life. I do like this card you created to share with us and all of its details. Oh how gorgeous Grace!! You know how I love every detail!! Stunning use of the fibers, cage, holly and the vintage design!! You know I am praying for you my friend!! Big hugs!! Thanks for supporting the ODBD challenge this week too!! You are the best friend a girl could have!! Beautiful card. Grace, and thank you for sharing your thoughts and challenges. Aaahhh...what a beautiful card Girl! I love your dimensions...your embellishments are perfect for this creation! Also love your way of showing a different perspective on the verse...it certainly made me feel better! Thank you for sharing and I wish you a wonderful week! Stunning! That birdcage is just amazing! Love it, Grace! Grace, you card is absolutely stunning! Thanks so much for sharing it with us at Frosted Designs! Grace your card is gorgeous, and your words so true!!!! I loved how you put the cage on twice. I love the dimension! The fibers and lace and gold make this look so elegant and rich!! LOVE IT!!!! Praying for you my friend!!!!! So often, these past few years, I have thought about this poem which has such an important teaching woven throughout its verses. I believe God is going to make you and your husband a blessing to many others in the days ahead. P.S. I tried the email link on your site but for some reason, it doesn't seem to open up in my computer (it is a tempermental machine)!!! I didn't receive your email in my inbox either... sorry Grace. This card is absolutely gorgeous!! Thank you so much for joining us in this challenge over at 365 Cards!!! This is not just a card, this is a piece of Art, I'd be reluctant to give it away if I'd made something so beautiful, but whoever receives it will be very blessed! Beautiful card. Thanks for joining us at SSDS with your lovely creation. What a gorgeous, detailed, and joyful card! I love the gold chain link trim at the bottom! Is it made of a non-metal material? I hope to see you create with us again at Frosted Designs! Grace, this is stunning, just like you.. It's a beautiful card, very elegant and full of details! Great work with the challenge! Congratulations! You have won the Card of the Week from the He IS Able blog! I just love this card you made for SSIC. I have had my eye on that bird cage die cut for a long time! The holly leaves look incredible...I love how the leaves shine and the colors blend so beautifully on it. And, I love how you used your dp...it is a beautiful and unique layout! I love how perfectly you described what it would be like to be yoked to someone in life. The fly on the back is a great example! I am praying for you and your husband at 10am and 10pm...plus whenever I think of you. I say this, so that if anyone reads it, perhaps they would like to pray at the same time. It is wonderful being yoked to Jesus. I can't imagine having continued with the life that I had before I knew Him. It was so different. So empty. Thank you for sharing not only this card, but all of these different things to think about. You are so talented...and I know that God uses you to reach so many people. Beautiful card. I love all the elements of the card. Thanks for playing along with us here are Speedy the Cat's Friends challenge this week. Hope to see you again next week. Grace your card is so beautiful!! I love all of the wonderful details. Thank you for playing along with us this week at Speedy The Cat's Friends Challenge. 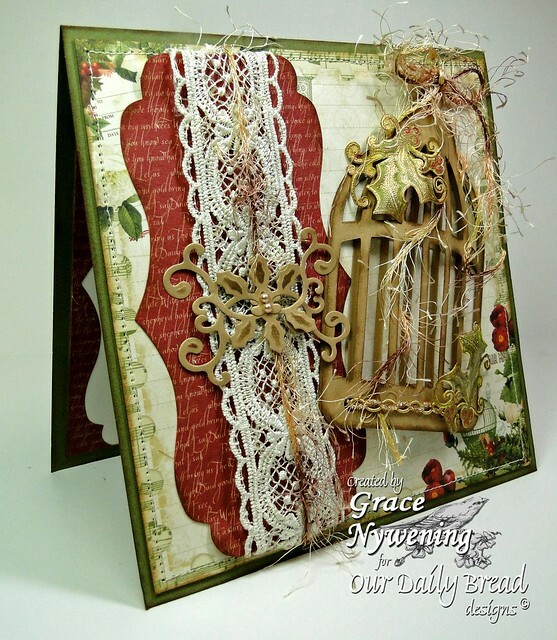 Grace, this card is stunningly gorgeous with so many elements to catch the eye...I love it!! That die is so beautifully done, and the papers with the twine is so pretty!! Thank you for sharing your wisdom regarding the chosen verse...it was something new to me that I had not considered when seeing this verse. And am praying for you and your family!! This is absolutely STUNNING!! can't find better words to express your creativity!! Stunning card, love everything about it. Thank you for sharing with us at Crafty Ann's this week. This is beautiful Grace. I know that you have had a rough week and I am so happy we got to have coffee the other day. You are so strong and I know that God does have a plan for all of us. As I was driving home I was remembering all the times I sat in awe of you over the last few years. You are a true testiment of faith and I know that good things are in store for you. Hang in there my friend. I am praying daily for you and hope that there is resolution soon so that you can have some peace. Hi Grace, so glad I am finally getting a chance to get around to everyone's blogs to see the beautiful creations based on Miesje's challenge. This has been a HARD week for so many, and her and your reflections on this verse are just the balm needed for a tired and weary soul. A lovely card. A really different design. So eyecatching. Very very beautiful! Love the vintage elegance of the whole card!